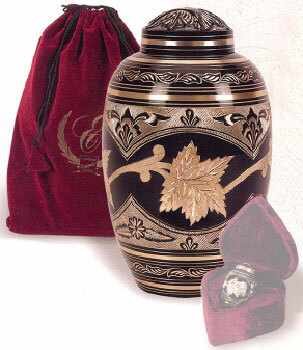 Our Black Toledo Leaf Brass Cremation Urn is an individually hand-tooled solid brass urn. Classic style with black Toledo finish. Engraved and leaves, flowers and eternity rings. Threaded screw-top lid. Felt bottom. Includes Velvet Pouch . The urn was beautiful. I couldn't be more pleased with the quality. 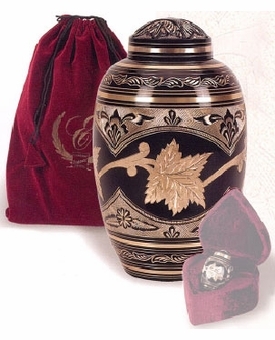 I also found the lid to be much more secure than many of the urns at the mortuary (it screws on tightly, and takes more than five, maybe seven, complete revolutions--it's not coming off unless someone intentionally takes it off). I paid for the 2-day shipping, and it arrived right when promised.